laborer of the eleventh hour: YOLO - so start living! 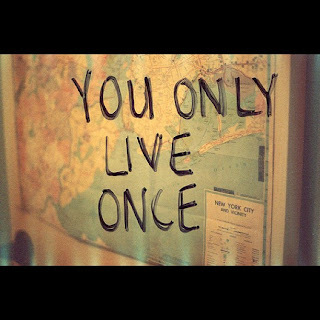 YOLO - so start living! #yolo (you only live once) has been trending on twitter like crazy recently, and has been the motto of many people at many points in our lives. Sadly, it has been used as a vice of doing something irrational, and justifying it to your friends, parents, and worse - yourself. To me, this is actually a very biblical principle gone wrong. It can be looked at two ways, I think. "Ah, its only marijuana, you only live once". And the second, "Maybe I should start taking things a little more serious, I can't lose any more opportunities, you only live once." This can either shape our lives into working for a focused purpose, or completely tear us down. I would like to focus on the latter, which may show us why the former may not be such a good idea after all. The way I like to picture God's plan is like a big puzzle, with roughly 7 billion pieces (estimated world population). Each piece uniquely shaped to fit somewhere that no other piece can take. YOU are that one special piece that NOBODY else can fill. God's divine plan is not like a job fulfillment, where if you don't get the job, the employer will find somebody else to fill the position. On the contrary, if you don't do what you were designed to do on earth, it won't be done! So if you go back to the puzzle analogy, you may be able to see the general picture, but its not complete, and that is the key. St Paul says in Ephesians, that "we are God's workmanship". Original Greek word for workmanship is poiema, the same word used for a poem. How beautifully crafted and thought out and touched up and perfected are poems? God did that with you. Okay, we've heard that God cares about us and we are special to Him and that if we were the only ones on Earth, He would've come to be crucified anyway. Do we really believe that? Do we really believe that God sees us differently than the rest of the 7 billion people here? The answer is you better believe it! It is not until you believe it, that you will actually start experiencing it! Think about that again. St Athansius says that one must believe first, then understanding will come. You wont understand what sky diving feels like until you jump, you wont understand what an in-n-out burger tastes like until you get that double double, and you sure won't experience the fact that you are the most important person in the world to God, unless you believe it. woah, ive been saying YOLO!!! but in reference to a positive note to encourage and keep moving forward with The Lord because you only live once. There is one life, one salvation, one baptism so I used YOLO lol, ok so not a good idea. thanks for sharing. God bless you! You're absolutely right! We should start using it to be living for God and realize that our life is a gift and God expects great things from it! Thanks for the encouragement, Sandy!